We start off with a Caribbean style tune, which is glee and wonderful. It has gotten stuck in my head, not once, not twice, but over trice times! It is slightly addictive, so don’t use with other addictive songs or else head implosion may occur. You might as well stop here then, since the rest of the songs are great also. Anyways, what makes this song great is the steady beat with accompanying rumba bass. The man-dog barking helps too, though in ways I’m not at all sure about. The main instrument, which I cannot quite pin of its identity, is clearly the star. Here we have the regal harpsichord, strumming away, leading into the heroic overtone. The carolers meet and greet the piano ancestor, and the flutes whistle us away to the clouds, where arch angels lay to be summoned. Smite your enemies down good knight. One of the better themes of the series, though I was first introduced to these games through the Gameboy variants, of which you’ll hear some music soon. It tries for the epic-ness of the PC version, and fails horribly. But, lest us not trash this one so quickly. It is memorable enough for recognition, for I am including it here. What makes it good? The 8-bit noise? Of course not, it is the simple up and down and repetition that sticks in your head. And there it lay, intoxicating. Company of Heroes did have a theme song originally, however I felt it was a little bit weak. In the expansion Relic added this gem. Not only is it good, but they also did better at working it into other songs in the game, making it more overarching. Works well as a menu song, and isn’t squandered b overuse in the game either. I have not fully played this game, but that doesn’t stop this theme from drenching my audio senses in yes! I like the tense diddy, hah pun, and also the foreboding atmosphere. Unfortunately, the song is a little shallow, mainly due to the limited technology, but improvements have been done by fans and later games. I’ve only played the demo for this game, but who cares; this PS3 Menu song is great with its rakish demeanor. Plus, being based on the presidential march, and being a game about presidential animal politics, it is quite a fitting choice. I leave the demo on the PS3 just to scroll down to this music every now and then. Reminds me a little bit of the 2142 Wake Island remix, but I assure you, this presidential March remix is better by far. Peppy, and starts offs vehemently, it takes a different spin on the guitar that some of the other pieces on Video Game Menu Music. The guitar strums echolalia themselves with more force, and enthusiasm, building the somewhat cartoonish character. I quite like it, short and jovially. A paragon of character selection music’s I’ve seen for a fighting game ever. Surely beats “taking someone for a ride” for about 5 minutes. Another heavy electric guitar piece, but it knows when to drop back to simple 8-bit origins every now and again. Makes you look forward to the upcoming fight. If you haven’t played Oregon Trail, you are a sorry lot. But, listen to this hum dinger here and perhaps you’ll be saved. Simple awesome, Oregon Trail 2 was the pinnacle of the series, and the music did not fail in its justice. (Each of the background songs are equally awesome). While colonial roots are questionable on instruments (sounds a little electrical at times), it still has that epic, going west gung-ness. This song is like coming across a dilapidated building and hearing ghostly murmurs. You don’t want to go in, but for some reason you are drawn closer. That is what I feel with this song. It is a bit annoying, and you certainly won’t be humming it, but it still carries a bit of charm, at least what you can find in-between the melody of Yoshi’s caterwauls. You know you are running out of music choices when Yoshi Story shows up as suburb menu music. Zott, you are resisting the Tetris music as well as TimeSplitters Future Perfect. All those Mario games are crying because they haven't been included. I need to do a post about the Mario and Wario platforming Gameboy games like Super Mario Land, Super Mario Land 2: Six Golden Coins, Wario Land: Super Mario Land 3, Wario Land 2, Wario Land 3. These games are amazing. Wario Land 4 was decent but was lacking the charm. I don't acknowledge Master of Disguise as a Wario game. I haven't played the Wario Wii game yet, but I will eventually. Anyway, there are tons of games that need to be included so there is always room for another Video Game Menu Music post. 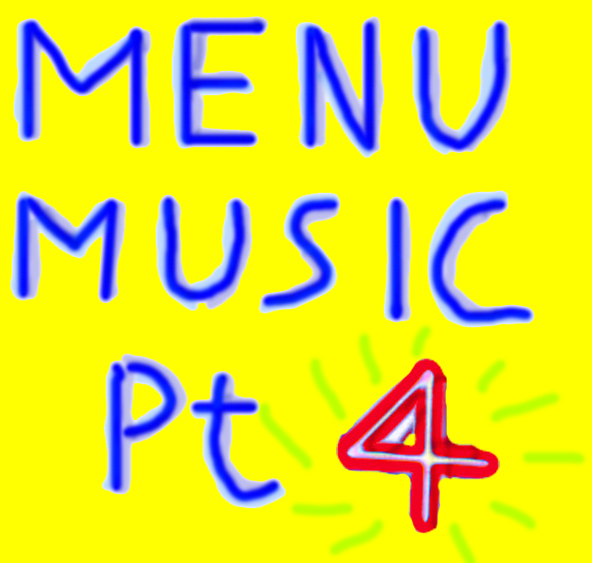 I'm going to do a Mario music post in the future that isn't constrained by the menu category. Yes, I shall agree that perhaps Wario was in need of inclusion. However, Yoshi's island is a valid choice here I feel. As for Tetris, everybody has heard it already, I'd like to highlight some songs that perhaps have a little more obscurity. Besides, Tetris B is also an ingame song, and isn't even that great I feel.